I strongly believe that a person’s worth is not determined by his or her productivity, accomplishments, etc. I am definitely OK with sitting still, rereading a book I love, watching the trees sway in the breeze. That said, accomplishing things is nice. One of my ongoing frustrations with being a stay-at-home mom is feeling that I don’t get much done. And even when I do, it’s either literally or figuratively consumable. At the end of the day/week/month/year, I feel have little to show for my efforts. I do have my healthy, happy family. I know I help them. And that’s of incredible worth. For my combination of personality and culture, it’s hard that their continued existence is often the only evidence I have that I’ve lifted a finger. I want that to be enough, and I’m working on it. In the interim, on overwhelmed days, I’ve taken to making “To Done” lists. Summer has flown by with travels, hot weather, random minor-but-inconvenient illness, and just general life. F is a sassy kid, and she’s completely hilarious and often extremely trying. C is mobile and huge – I’m actually having some lower back pain from carrying her. We just put up baby gates in the sun room so she has a safe place to explore. Too bad the air conditioner in the sun room doesn’t really work. Hot out. Lower 90s and humid. Enjoying our beach tent and kiddie pool, both in the back yard. Today, I literally tossed the tent off the deck folded up, it popped open mid-air, and was thus pretty much set up for me so the girls and I could hang out by the pool. Baby C just had a well visit, which confirmed what we thought: she’s doing great. Week 2 of our CSA included spinach, kale, scallions, Swiss chard, and lettuce. I processed it all the evening we got it, even though we had a late dinner and I didn’t get out of the kitchen till 11ish. It felt good. I cooked my most successful Glorious One Pot meal yesterday. It was mostly free-styled. Just need to do a better job adding seasoning. Well, we had our very first CSA pick-up yesterday! J and I had physicals that afternoon, and there wasn’t much of the work day left after, so all four of us went to the farm. We signed in and bagged our vegetables in a reusable bag. A bunch of this, a half-pound of that. We traded our collards for kale. We grabbed a pint container, trooped out to the field, and picked the strawberries that were part of our share. F was very interested in picking dandelions. We came home needing to make dinner for 5 adults and 2 preschoolers. Though we had a fair number of veggies, we didn’t have enough of one (or it turns out, two) things that would feed so many. So I made flash-cooked kale with garlic scapes and some simply sauteed spinach. And a ton of rice and chicken thighs. J kindly wrangled the dear, if slightly possessive, under-4 sweeties while I cooked in peace. Then we threw together scratch brownies (slightly underdone, as usual) and served them after dinner with the field-fresh strawberries. Heaven! Looking forward to bok choi and tatsoi this evening! Our first CSA pick-up is this afternoon! Greens, greens, and greens. And strawberries. Looking forward to a harvest-centered meal plan strategy! On Monday, I responded to what struck me as an odd point of view regarding clutter. 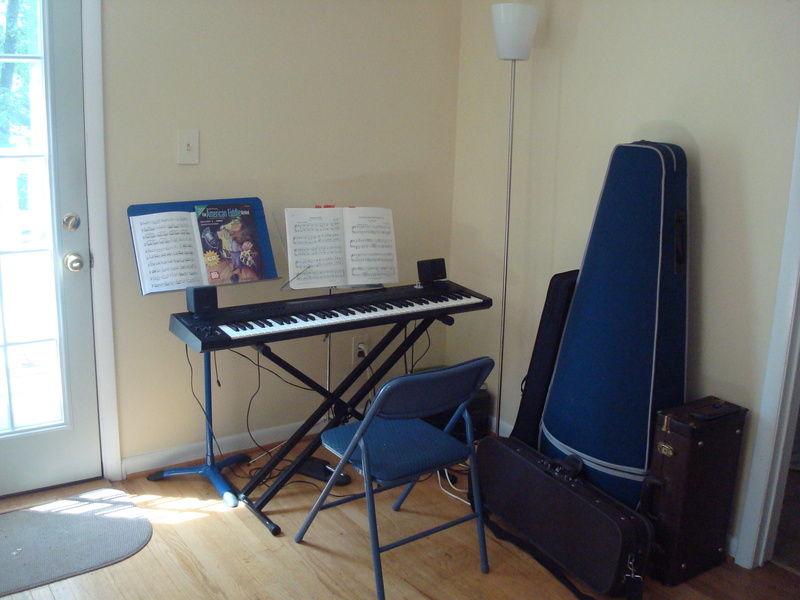 On Tuesday, I posted about the new music corner in the living room. To some extent, our stuff enables activities. The music corner prompts us to engage in music. I wouldn’t call it “clutter,” then, because it serves a (positive) purpose in my life. Though I’m interested in minimalism, I’m not hard-core. I don’t want to own only 100 things – but I have no desire to house items that I don’t use. I do not celebrate clutter! But I do agree with Ms. Browning that it’s enriching and wonderful to house items that we do use. My parents were in town over the weekend and between them and J, we rearranged a few things! We have a beautiful sun room that was added to the house in the early ’90s. It has skylights and tons of windows. And it has temperature control issues. Thus, it is a stupid place to keep your collection of string instruments. Unfortunately, that’s where mine had been from October through last weekend. We moved a living room shelf upstairs, scooted another living room bookshelf to the other side of the room, and freed up space for a music corner. My mother even thought to suggest we set up our keyboard. F, J, and I have been having fun playing piano. And now that my violin is living in a more temperature-stable place, I celebrated by restringing it. The music corner could for sure use some decorative touches and some wire control, but for now it’s together, accessible, and even dusted! Get Posts on Feedly etc.